Today is a great day for the World Cup. adidas has just launched the away kits for every of the brand's national teams at the 2018 World Cup in Russia. Dig in, and get a closer look at the away kits for Argentina, Germany, Spain and many more. A modern interpretation of the iconic 1993 Argentina shirt, the away kit for Messi and Co. at the 2018 World Cup is black with a sky blue and white stripe pattern on the upper sides. 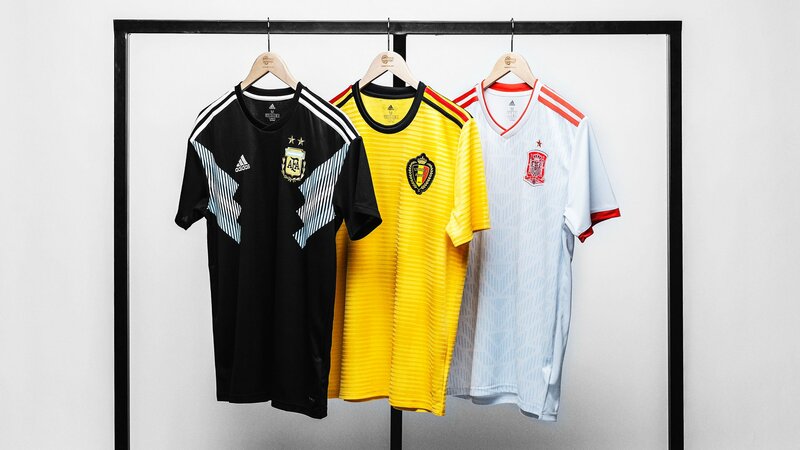 Based on the simplistic Condivo 18 template, the Belgium 2018 World Cup away kit is yellow with black and red trim, and a black crew-neck collar. A subtle striped all-over graphic print rounds off the look, just like on the Condivo 18 teamwear. Another kit taking you back to the 90s is the blue and orange Colombia away shirt. The kit features a graphic print on the front left side that derives from Adidas' early 1990s kit designs and is modeled after the Mulera, a traditional scarf Colombian coffee growers (Cafeteros) often wear over the shoulder. Inspired by the Adidas EQT kits of the 1990s, the predominantly light grey Japan 2018 World Cup away kit features the same collar as the home shirt, with a bit of white trim around the top. Drawing inspiration from Mexico's kits of the 1950s, the Mexico 2018 World Cup kit's classic complements the retro modern home shirt. The away kit is predominantly white with a red, white and green horizontal chest stripe, honouring the Mexican flag. A subtle look from adidas, the white Russia 2018 away shirt has a blue crew-neck, blue sleeve cuffs and a nondescript dot pattern covering the full front and sleeves, making the hosts ready for the big stage this summer. Just like the Belgium away shirt, the Sweden 2018 World Cup away shirt is based on the Condivo 18 template. The kit is royal blue with a subtle graphic print appearing on the front, back and sleeves. The Germany away kit for the 2018 World Cup introduces a retro-infused look in 'EQT Green'. Drawing inspiration from the early 1990s and the 1994 away with its blueish shade of green, it's the first green Germany away jersey since Euro 2012. One of our favourites already at Unisport HQ. Inspirered by a 1980s all-over graphic print and Spain's light blue kits of the past, the Spain World Cup 2018 away shirt gets a unique look with a 'Halo Blue' (a very light, almost white shade of grey) colour, making the proud nation ready to fight for the trophy in Russia.